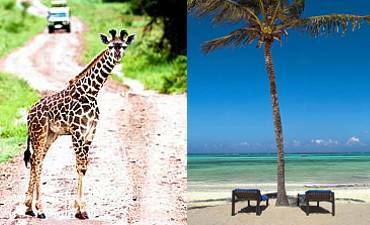 Do You Need Beach Ideas For Your Tanzania Trip? Scroll Down For Details.. Experience powdery soft, sandy beaches in Tanzania, all caressed by the gentle waters that is offset by the scintillating azure of the warm Indian Ocean against a backdrop of the blue skies on the horizon. 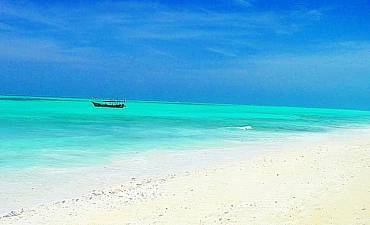 Review beach accommodations in Zanzibar (Including Mnemba, Chumbe, Chapwani), Pemba, Mafia, Bagamoyo (Lazy Lagoon), Kilwa (Fanjove) and Dar es Salaam (Kunduchi, Ras Kutani, Jangwani). 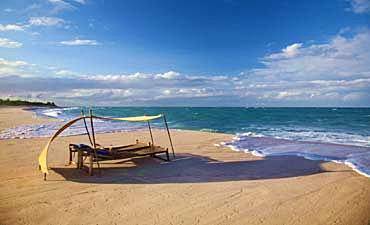 The beaches and island of Tanzania afford distinct tour experiences, from snorkeling and scuba diving, deep sea angling trips to tours of historical settlements, museums, ruins, forts, and much more. The coast off Tanzania and its islands are blessed with an incredible underwater world that is to be seen to be believed. Experience a snorkel trip to view diverse corals and a hued array of marine life. 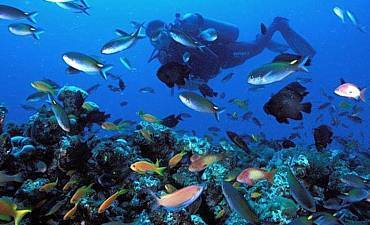 Tanzania has varied scuba diving sites, from Mafia Island Marine Park in the south to Pemba Island and Pangani in the north. 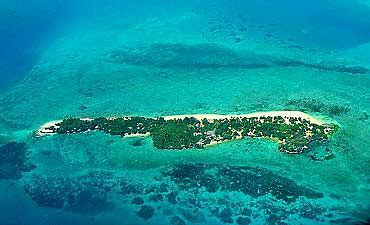 Prime diving is also available in Zanzibar Island, especially at Mnemba Atoll. The island waters surrounding the Zanzibar, Mafia, and Pemba, and also the coastal metropolis of Dar es Salaam, present many thrilling opportunities to hone your skills against some of the toughest fish. 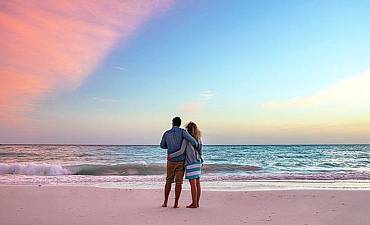 The first few weeks of your new life as a couple are marked with intimacy and romance as you devote your entire post nuptial escape relaxing in a bosom setting on an isolated, unspoiled seaside in Tanzania. Getting married and sharing your life with your loved one is a wonderful step to take as part of your rite of passage. 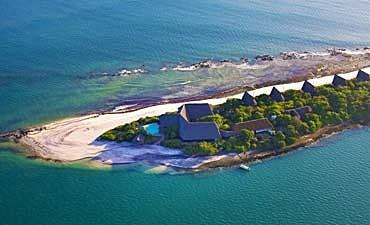 Tanzania should be your first choice for the perfect setting for a beach wedding. 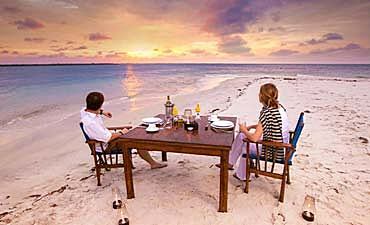 An intimate beach vacation to Tanzania revitalizes and strengthen your household union. Use this time for vital reconnections with your family and build bonds and memories that will last a lifetime. We arrange world-class yet little known, rustic boutique resorts to premier beach villas in Tanzania where you can be assured of personalized, discreet services, perhaps, with a private butler service. Tanzania is a spectacularly salient country with varied landscapes and ecological diversity of flora and fauna, from avian, terrestrial to marine, coupled with castaway experiences on soothing turquoise shores. Miles and miles of gorgeous white, powder soft sand beaches warmed by the tropical sun and washed gently by the warmish waters of the Indian Ocean. Look out over the sea and you will be charmed by the sight of the turquoise and azure waters almost blending into the horizon with the incredible clear blue of the skies. The rich, lush tropical vegetation of the trees and shrubs creates a striking contrast to the white sands and even as you revel in these glorious vistas on your beach vacation in eastern Tanzania, you cannot help but think to yourself. Surely, this is paradise. Tanzania not only has many glorious seaside locations for a sun-kissed holiday, it is also blessed with many islands, large and small, each offering you something unique. Seclusion, tranquility, the scampering of island fauna, melodies of birds and eco-friendly living spaces will completely captivate you. Each island has all that and more. Some of the accommodations are built along traditional Swahili building styles so you can enjoy the distinct experience of island living while others have a more contemporary, boutique feel. You might also want to look for deluxe or economy resorts and hotels to stay over during your AfricanMecca travels, and Tanzania has those too. The waters off Tanzania have the perfect conditions that support delicate coral gardens and using the islands as a base, you can explore these wondrous underwater Edens that teem with innumerable marine creatures. To view them closer, you could go on snorkeling in the shallow waters where the sunlight streams through clear waters to light up an ethereal world that incandescence with color. Snorkel expeditions in Tanzanian seas are perfect for first-time marine explorers, and you won’t need special skills to discover these wonders on your coastal retreat. The sheer varieties of reef fish, turtles, octopi, mollusks, sea flora, coral, and countless others will take your breath away even as your guide points some hidden creatures that are skilled at the art of disguise. If you are a certified PADI diver, the highlight of your beach trip will certainly be scuba diving in the coral rich sea sites of Tanzania. Should you visit in the migratory season, you might even chance to witness humpback whales traveling along the coast or you might watch whale sharks feeding on plankton that abounds in the upper waters. Each experience is a memory to be cherished that you are sure to treasure always. 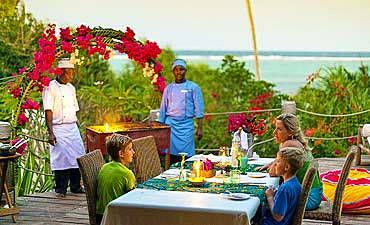 If its memories you are seeking, Tanzania is the perfect location to spend a family seaside vacation with your children. Introduce them to the wonders of the marine life as they play in the soft sands on the shore. The receding tide leaves behind many creatures in tiny rock pools that your kids will love to view. They will also enjoy the sight of colobus and vervet monkeys frolicking in trees and brilliant tropical birds flitting through the foliage along with a myriad of butterflies. Teach them to snorkel or scuba dive in the tame waters or pool, and also have them try out other water sports, from jet-skiing to kayaking. The incredible beauty of Tanzania serves as the perfect seaside backdrop for a dream marriage ceremony, and you could choose one of the many beaches and islands hidden away for a small, intimate wedding. If you have your friends and extended family over to share your special day, AfricanMecca Safaris can arrange for an enriching beach tour of ruins and coastal settlement towns to combine with the wedding while they are in Tanzania. Trust us to orchestrate the perfect wedding and to look after your guests. 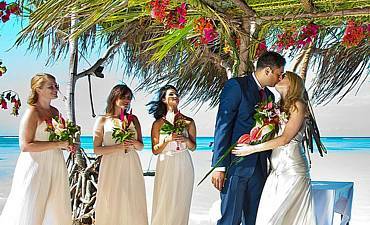 A perfect beach wedding deserves an idyllic honeymoon, and there are many destinations to spend it as you plan your post-nuptial life ahead. 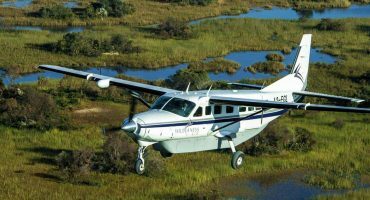 You can also plan a combination bush and beach tour with a few days at a castaway seashore location and the rest at a safari wilderness park in Tanzania. Enjoy viewing the wondrous terrestrial animal and bird species that this magnificent country hosts. Go walking in the bush and learn how to track animals or float over the landscape in a hot air balloon for a bird’s eye-view of the treasures of the land. End your breathtaking excursion with a champagne breakfast in the bush. Some discerning guests like to spend their beach holiday in the lap of luxury with the very best that Tanzania has to offer. If that is what you are looking forward to, there are small, intimate resorts on distinct beachfront location for a barefoot boutique escapade. Live life the Sultans must have in sprawling, exclusive villas that offer fantastic vistas of the ocean. Dine on the finest of cuisine, cooked to perfection by your personal chef even as your private butler tends to you every need. Soak in your plunge pool in complete seclusion or sunbathe beside your swimming pool. Revel in the skillful reflexologies of a masseuse and head out to the spa later. 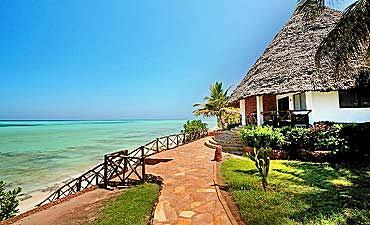 Tanzania has a rich cultural heritage that you can enjoy when seaside touring the country. Over the centuries, many explorers from different realms have passed through it, some as traders, others as conquerors, and then some others to revel in its stunning beauty and allure. You will find many remnants of ancient civilizations and old buildings that still stand strong today. They speak of their designers and unique architectural styles that have taken on a quaint charm over the years. The pelagic waters off the coast of Tanzania also in turn support a large variety of game fish that you might want to try angling on your seaside vacation. Some of the stalwarts of these waters are seasonal while others hunt here all the year round. Enjoy pitting your skills against theirs as they struggle to get away, and later, release them according to the catch and release regulations of the country. 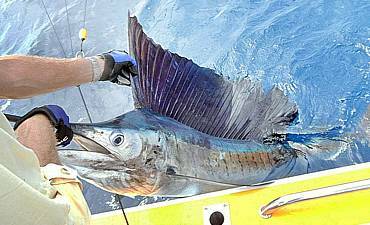 First-time anglers can learn the intricacies of deep sea fishing in Tanzania as expert skippers direct their efforts. Every moment of the AfricanMecca holiday you devote in Tanzania will be so enjoyable that you will make yourself a promise as you leave - that you will surely return once more. 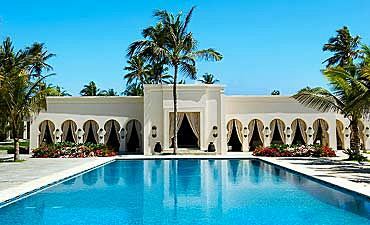 An exquisite Indian Ocean jewel, off the east coast of Tanzania, Zanzibar or the Spice Island is a laid-back little settlement where history whispers and pristine beaches sooth your mind, body and soul. Zanzibar is a tranquil, beach paradise for an idyllic Indian Ocean vacation in Africa, amidst soft, white sands and the shimmering turquoise waters dotted with picturesque traditional fishing dhows. 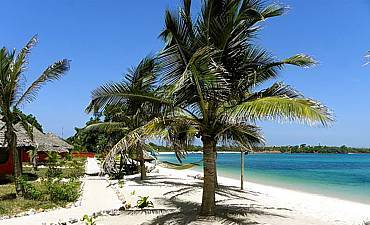 Dubbed as the Green Isle or El Huthera by early Omani sailors, Pemba Island is a beautiful, verdant East African jewel set in the shimmering romantic azure of the Indian Ocean unspoiled by modern civilization. 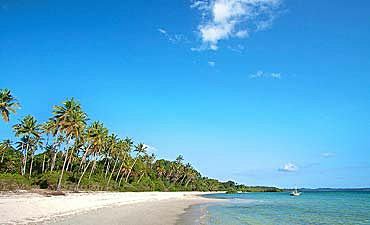 With the Rufiji River Delta on the western mainland of Tanzania and the expansive Indian Ocean on the east, Mafia Island offers unspoiled white beaches washed by the crystal azure waters of its marine park. Visit Bagamoyo for a cultural, historic and beach tour and you will be struck by the serenity of this town having experienced a brutal past. Time seems to have passed it and left it untouched but hurt. You will discover that there is a lot you can do on your Kilwa seashore experience. 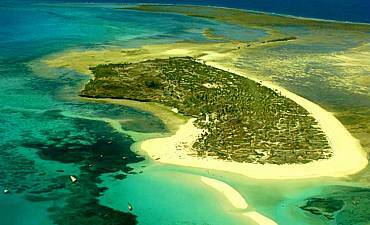 You could visit the different beaches and surrounding idyllic islands with their lush tropical flora and marine life. 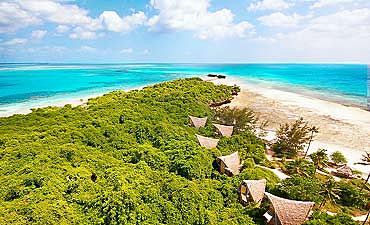 Surrounded by pure turquoise waters, set out to take a barefoot stroll on the soft, powdery sands of Mnemba Island where the soft breezes of the Indian Ocean caress you, allowing you absorb the tranquility. 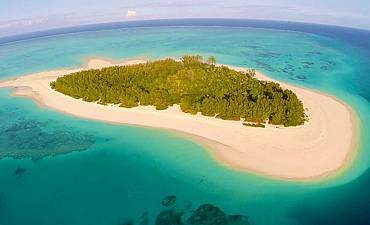 An incredibly beautiful isle, Chumbe, located in the Indian Ocean off the west coast of Zanzibar Island is a stunning marine island park that was the first to be gazetted by the Tanzanian government. 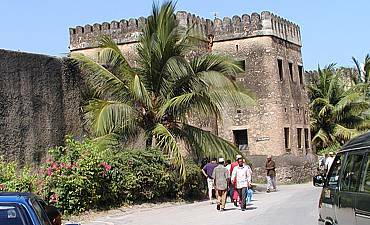 Chapwani is a narrow strip of terrestrial land in the Indian Ocean lying on the north of Stone Town off the western island breadth of Zanzibar. This isle is merely a kilometer long and about 100 meters wide. A slim piece of terrestrial land off the coast of Bagamoyo in eastern Tanzania with a gorgeous lagoon with azure blue waters and a distinct eco-system of mangrove forests with outlandish marine life. Part of the Songo Songo Archipelago, Fanjove has the impression of leaving civilization behind, and entering into a world of sheer isolation, tranquility and beauty, the kind that you can only dream about. 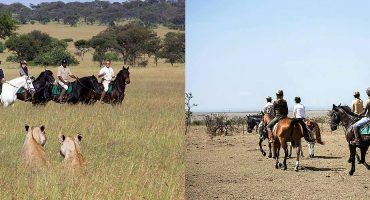 Review Tanzania detailed itineraries and prices of our recommended safaris with the option of customizing your Africa tour based on your preferences and needs. Review experiences available in Tanzania from photo wildlife safari, chimpanzee tour, bush walk, family to honeymoon beach vacation, snorkeling, diving etc. 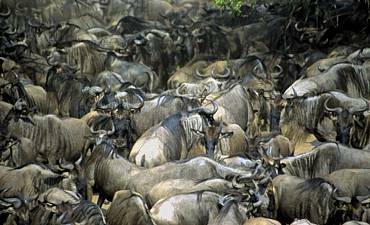 Review information on wildlife parks and reserves in Tanzania i.e. 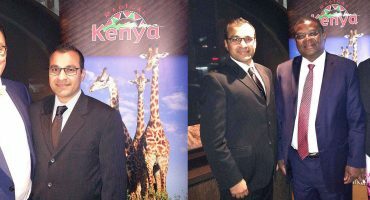 Serengeti, Ngorongoro, Tarangire, Ruaha, Manyara, Selous, Katavi Gombe, Mahale and more. 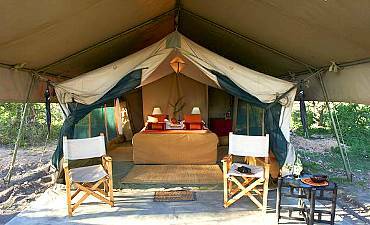 Review information on safari camps, lodges, city hotels, beachfront resorts in Tanzania's pristine wilderness, cities, Swahili coastal shores and idyllic islands. 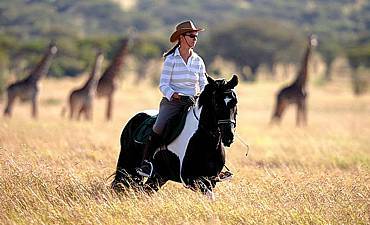 Review details on the best time to go to Tanzania to visit its various wildlife outback, lakes, rivers, beaches, islands, mountains, forests and other wildernesses. 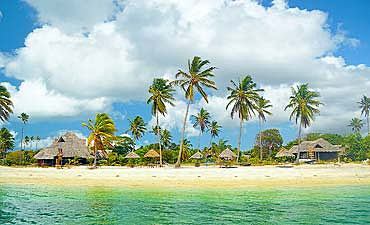 Review Tanzania's unspoiled white, sandy coastal beaches and idyllic islands backed by tropical forests that are lapped by the azure waters of the Indian Ocean. 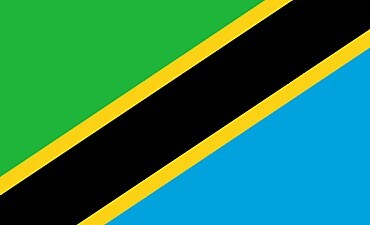 Review country information and travel tips on Tanzania i.e. climate, history, geography, culture, entry requirements, what to pack and wear, tipping guide and more. 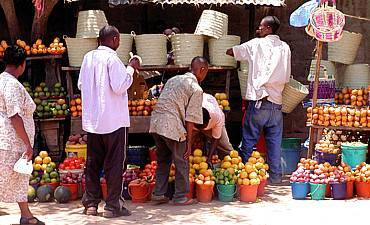 Review city tour recommendations on full or half day options in Dar es Salaam, Arusha, Zanzibar. Experiences can be customized around your vacation travels. Review Facebook, Twitter, YouTube and Instagram real time social media news for Tanzania parks, beaches, islands, towns, Kilimanjaro climbs and more. When visiting Tanzania, we recommend combining your safari to Serengeti, Ngorongoro Crater, Tarangire and Lake Manyara with an extension out to Southern or Western parks like Selous, Ruaha, Katavi or Mahale - Gombe ending with a beach vacation and Swahili cultural tour in the exotic spice island of Zanzibar, Pemba, Mafia or Fanjove. You can also day trek or climb the highest mountain in Africa - Kilimanjaro. 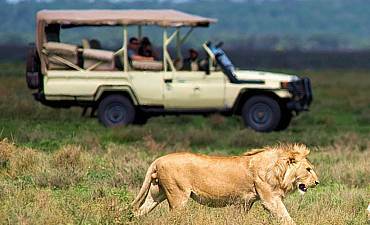 ARE YOU PLANNING AN AFRICAN SAFARI TO TANZANIA? 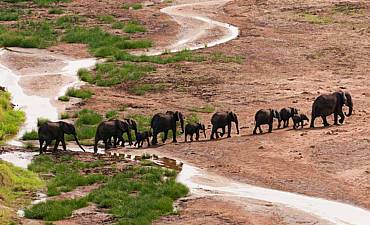 HAVE YOU VISITED EASTERN AFRICA FOR A SAFARI IN TANZANIA?